Today's rapidly changing environment of education, research and Industry demands flexibility and expandleability in all aspects of design & testing. The instrument market is fragmented because instruments are specialized in hardware to serve several slightly divergent test applications. In fact, the traditional classification of measurement instruments (such as Voltmeter, Current meter, Frequency Counter, Function Generator, Oscilloscope, Power Supply, etc.) has now become a single entity with software interactivity. In the present scenario, the concept of circuit design has been switched from discrete design to system on chip i.e. SOC type design. Firstly todays IC is software configurable and for that user has to use software interface using PC / laptop. So the computer is the necessity for engineers in all domain (basic electronics, VLSI, Embedded, DSP, Communication, Instrumentation, etc.). Secondly traditional TMI is the basic need for the design engineers. In this modern world, Scientech DesignLab 2 is an ultimate solution for engineers in design, application, and in field services. It is space saving, allows faster testing time, and faster troubleshooting. 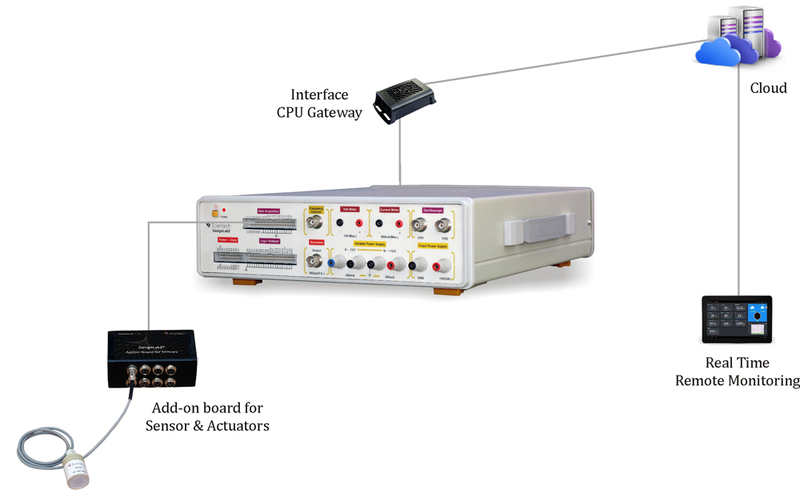 DesignLab 2® has different TMI capabilities like Digital Storage Oscilloscope, Mixed Signal Oscilloscope, Logic Analyzer, Synthesized Function Generator, Pattern / Word Generator, Programmable Clock, Programmable Power Supply, Data acquisition, Volt meter, Current meter etc. It has features of analysis on multiple large and simultaneous windows, storage of waveforms on PC, sharing waveform data, virtual component library for real-world hardware interface and event scheduler to automate testing. Now Institutes can simply have one DesignLab 2 and one laptop/tablet on each table, replacing multiple TMI boxes. 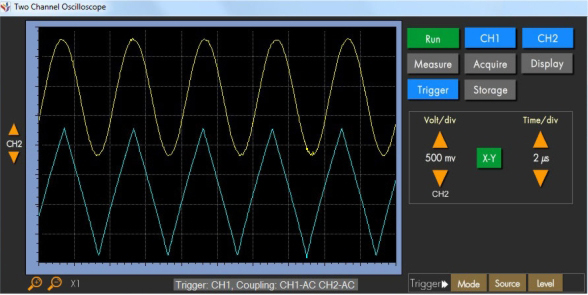 Generate standard Synthesized Signal waveforms like Sine, Square, Triangular, Ramp, and Pulse. 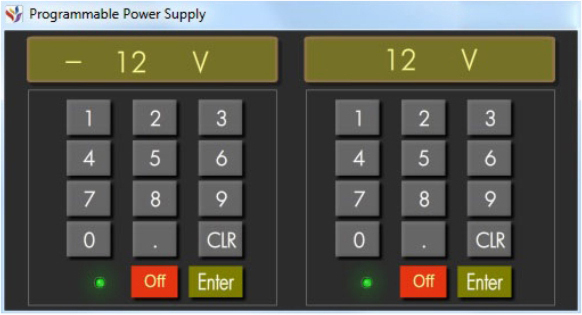 Set and change its parameters using user friendly Graphical User Interface (GUI). Pattern Generator Generate 8 different repetitive pattern of 8 bit length. Clock frequency of generated pattern can be changed using its software screen. Clock Generator separate output for clock signal can be generated to use or to trigger any external design under test. Fixed Power Supply that can be used to power high current digital electronic circuits. Variable Power Supply can be used to power analog or digital circuit where positive and negative supply is to be used; Output required can be set by interactive GUI provided for Power Supply. 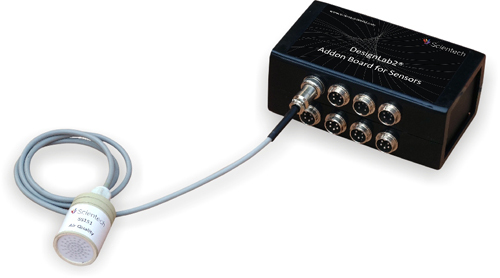 Capture and display multiple signals from a digital system or digital circuit. Cursors are provided to analyze signal and result can be stored in Image format. 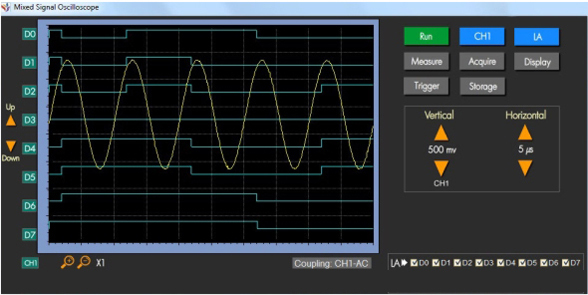 Analyze Analog or Digital outputs of your design under test on two channel Digital Oscilloscope. Volt per division, Time per division can be changed by a single click. 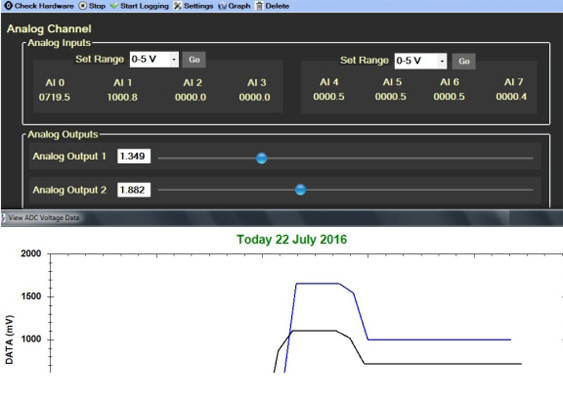 User can measure frequency & amplitude and store results in image or CSV format. Analyze one Analog and eight Digital outputs of your design under test simultaneously on software screen. 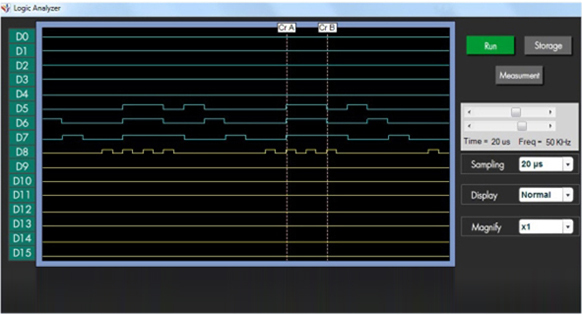 Use CH1 for Analog and D0 to D7 of Logic Analyzer. 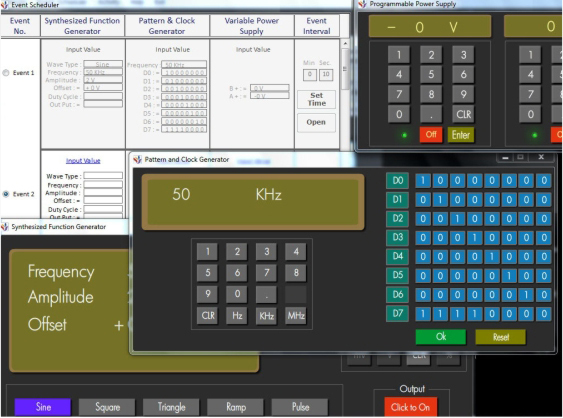 Connector for Digital Signals, Volt per division, and time per division can be changed by user friendly GUI screen. Measure Frequency or measure the number of oscillations or pulses per second in a repetitive electronic signal. Measure the potential difference, or voltage, between two points in an electrical or electronic circuit and to measure the current in a circuit. Acquire & Measure an electrical or physical phenomenon such as temperature, humidity, pressure, sound etc. with software provided. Can also be used as Analog and Digital Input output device and data logger. For multiple or repetitive testing / calibration. It can also be used to schedule the event for all the built in instruments and can be use all instrument parallely. Activity Tool: It is a special tool to use virtual component in real time, components like switches, LED, displays, combinational, operational amplifier, motor interface, relay interface and many more components are available. Virtual Analog-Digital Component like Switches, Display Devices, Computational Circuits, Operational Amplifier, Motor Control and Relay Circuits. The extensive features included within Interface CPU Gateway make it the perfect solution for DesignLab 2. Apart from integrating with DesignLab 2 user can also use for various applications such as Robotics, Drone, Machine Vision, Smart Home, Education, Digital Signage, Intelligent Cars and Internet of Things (IoT) solutions. Add-on Board will help user to connect their sensors or actuators directly using stand 5 pi connector. Overall it will simplify connection and accelerate interfacing time. Moisture on vegetation from 0 (dry) to 15 (wet). If you are an impatient circuit designer who wants to replicate software design on the PCB with high precision and accuracy, and also without investing much of your valuable time and efforts, we have an exciting solution for you. Nvis 72 PCB Prototype Machine provides several features which can make your life easier. With this new electro-mechanical utility, you can escape cumbersome task of traditional PCB designing which involves time taking etching and drilling processes. Get rid of dealing with chemicals which often spoil your hands and are harmful to you and environment. Provided with the USB connectivity, Nvis 72 can print your desired circuit on the PCB within minutes. Accompanied design software provides simple and elegant interface which is user-friendly, and can even be operated by novice Engineers and Students.